Setting up a commercial payer in Console Pay is the same as a residential payer without the schedule creation. As Commercial tenants pay their rent by invoices issued by an agency, the setup process allows you to skip the schedule creation page and move straight to the credit card and bank account details page. Enter your tenant details as a residential tenant, refer to Creating a Console Pay Tenant if required. At Step 1: Create Payer – we suggest utilising the name fields in the below format. 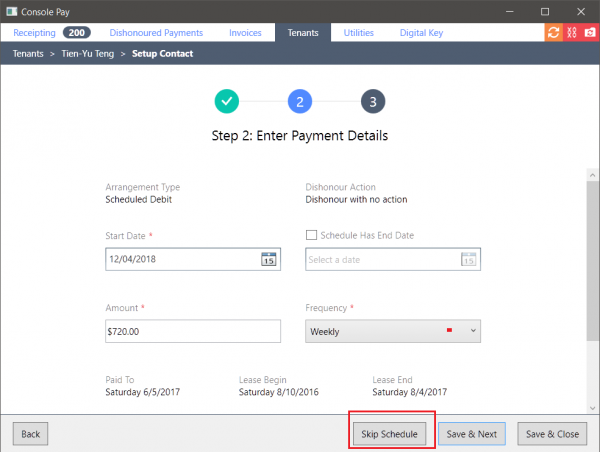 At Step 2: Create Schedule – click Skip Schedule. * Scheduled commercial invoices appear on the payers’ view schedule page.